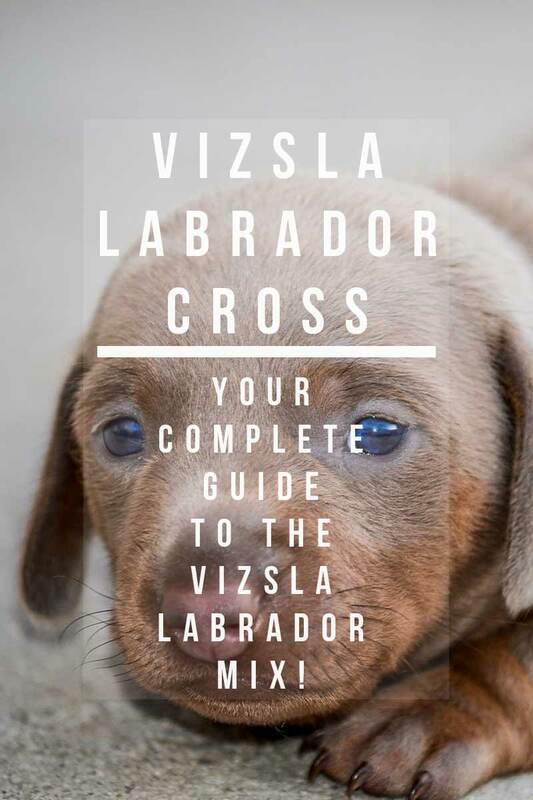 Welcome To Your Complete Guide To The Vizsla Lab Mix! Designer dog breeds are the subjects of a lot of controversy at the moment, but they are also extremely popular. From the Labradoodle to the Cockapoo, and now the Vizslador! A cross between the Hungarian Vizsla and the Labrador Retriever. But is buying a first generation mixed breed dog a good idea? What are the pros and cons of owning a pup whose parents were from different sporting breeds? And what can you expect from a Hungarian Vizsla Labrador Mix? In this article, we’ll talk about the history behind the Hungarian Vizsla Lab mix. His possible physical characteristics and behavior. And the health concerns, grooming and exercise requirements he will have. What is a Hungarian Vizsla Lab mix? The “Vizslador” or “Labrala,” as this mixed breed is sometimes called, is a cross between the Labrador Retriever and the Hungarian Vizsla. These breeds are two members of the sporting group, but they have slightly different roles. Since Labradors were originally bred as retrievers of water fowl in Canada and Vizslas were developed in Europe as hunt point retrieving dogs, the Vizsla-Labrador mix can be a superb hunting and gaming dog. However their roles are actually quite different in the field. If you are look for a hunting companion then it can be because you want a specific job fulfilling. Where this job is retrieving a Vizsla Lab mix will almost certainly excel, as both parents are bred for the task. But if it’s pointing you are after, then a pure Vizsla would be a safer bet as their mixed breed pups may or may not inherit the inclination to point. Where they pause, with one foot raised. Both Hungarian Vizslas and Labs are fairly easily trained, and enthusiastic. Sporting breeds like Vizlas and Labradors have been crossed for years in order to combine favorable characteristics of each breed to achieve the perfect working dog. Vizsla Lab mix dogs as working companions can be said to have the retrieving capabilities they want, without that Labrador over friendliness and bounciness. Early Labradors were primarily bred as retrievers of water fowl, while Vizlas were bred as trackers of land-dwelling game, but were also trained to retrieve water fowl. Given the Labrador’s lineage and the Vizla’s mix of pointer and retriever blood, it’s safe to say that a Vizsla crossed with a Labrador could result in a very useful land and water hunting partner. However, you can never be totally sure with a mixed breed dog which characteristics will be expressed. So later in the article we’ll be having a look at what they have in common, and wheat they don’t. Be first, let’s take a look at where these gorgeous dogs came from. Where did the Vizsla Labrador come from? It’s difficult to say exactly when and where Vizslas were first crossed with Labrador Retrievers. What we can say with relative confidence is when the Vizsla and Lab breeds were developed individually. As its name hints, the Hungarian Vizsla was bred and developed in Hungary. However, the Vizsla’s ancestors can be traced as far back as the eighth century. When pointer-type hunting dogs were being bred (and even were trained to hunt with falcons!) to work in all kinds of terrain in Europe. It wasn’t until shortly after World War II that a concentrated effort was made to preserve the breed, as it had become all but extinct. The Vizsla that is found across America today descends from foundation breeding stock that were exported to the United States around that time. After further refining took place, the American Kennel Club (AKC) recognized the Vizsla as a member of the sporting group in 1960. Like their early brethren, today’s Vizslas make superb hunting dogs, but with show-quality looks and intelligence. They are also contenders in the versatility ring and the field. You’ll also find them in service roles, where their trainability and excellent noses can be put to use in tasks like search and rescue. 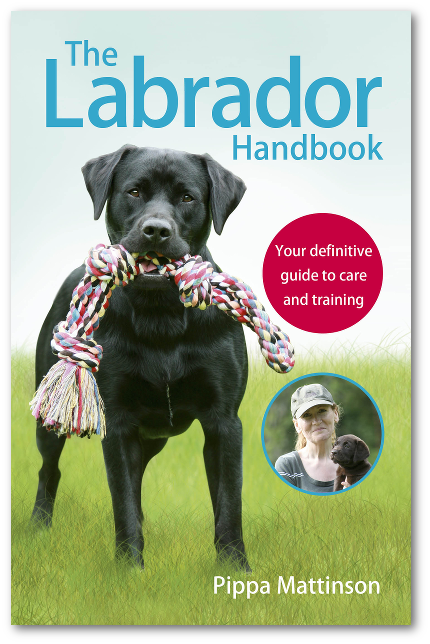 Another descendent of early hunting dogs, the Labrador Retriever breed was first developed in Newfoundland, Canada. Its ancestors were developed through the mating of water-fowl hunting dogs with Newfoundlands. Labrador Retrievers eventually made their way to the United States, where they also became popular pets. 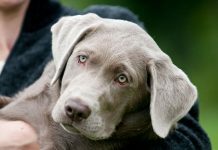 The AKC recognized the breed as a member of the sporting group in 1917, and today, the Lab remains the most popular dog breed on the AKC’s registry. While Labradors are still used as hunting dogs, they’re also found in the line of service. Similarly to the Vizsla, their warm personalities, above-average tracking abilities, and intelligence make them amazing seeing-eye dogs, search and rescue dogs, and therapy dogs. So we know that both Vizslas and Labradors have a strong history of working cooperatively with their owners. Which is a great characteristic for a potential pet! We also know that they are sporting breeds, which means they are intelligent and need a lot of exercise. It is also widely accepted that the two breeds have been crossed informally for a long time by members of the hunting community. However, it is only more recently that it seems pet owners are finding enthusiasm for this mix as well. Taking into account what we know of both breeds, what can we predict when it comes to the temperament of a Vizsla Lab mix? As a hybrid dog, the Vizslador’s temperament is typically a mix of his parent breeds’ temperaments, or he may favor one parent in personality as well as physical traits. 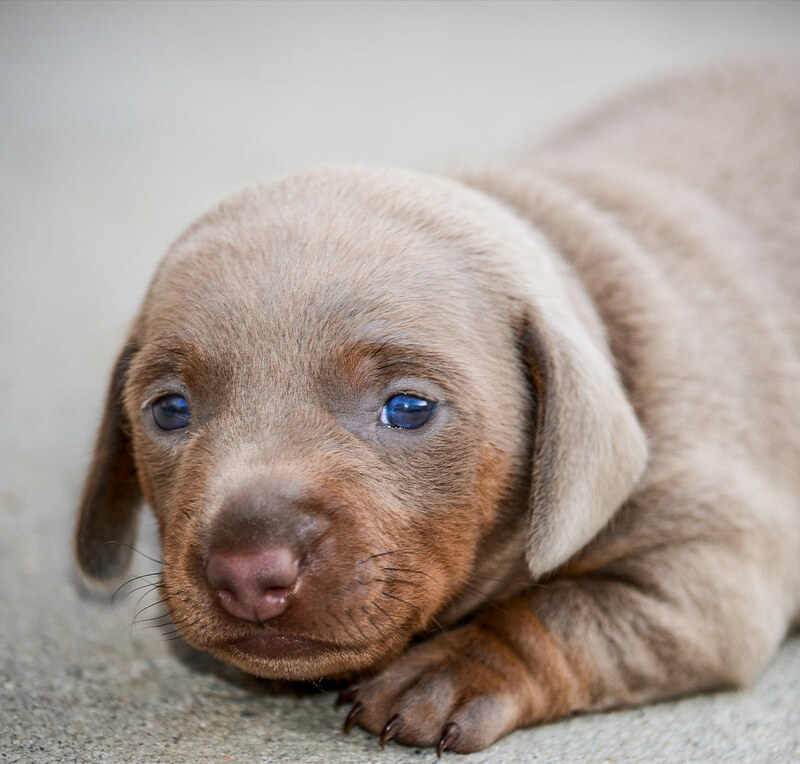 With any mixed breed dog, it really is a 50-50 chance that a Vizsla Lab mix puppy will come out more or less like a Labrador Retriever or a Vizsla. Even puppies from the same litter can look and act vastly different from each other! One thing that you can be pretty certain about, though, is that a Vizsla-Labrador mix will be a super affectionate pup who wants to please you in whatever line of work that you put him in, even if his job is just being a much-loved family pet. It’s also safe to assume that a Labrala will be a highly energetic dog with a love for following his nose and a level of intelligence that can sometimes get him into trouble, should he get bored! You’ll want to consider a fenced-in yard to ensure that he doesn’t follow his nose where he shouldn’t go. Additionally, neither Labradors nor Vizlas cope very well with isolation. This is par for the course with dogs that are big lovers! You’ll want to be sure that your dog won’t be spending a lot of time locked in a crate or at home alone, as it’s quite likely that he’ll find something to ease his boredom or anxiety. 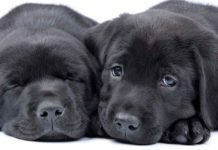 If you are considering bringing home a puppy and you work full time, there is some great advice here. 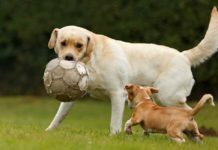 Like any high-energy breed, Hungarian Lab mix dogs love to be able to run and play and put some of those hunting instincts to use! Even if you intend to keep one as a pet only, he’ll love it if he can chase a Frisbee or retrieve a toy duck every so often. Furthermore, Vizsladors can be pretty excitable dogs that may not have a sense of boundaries when they are happy to see you. Obedience training will go a long way for these guys, but let’s be honest, obedience training is a great idea for puppies of any size and breed! The Vizslador will be at least a medium sized dog. Based on the expected height and weight of the Vizsla and Labrador Retriever, the hybrid will weigh up to 80 pounds (females will stay closer to the 50-70 pound range). They may reach 24.5 inches tall at the shoulder. You may find that even within a litter the puppies range in size and weight quite a bit. Mixed breed puppies can look more like one parent than the other, both in color and in physical attributes. 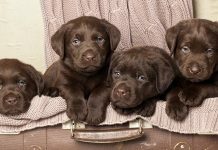 Labrala puppies might be born resembling a black, yellow, or chocolate Lab. Or they might inherit the Vizla’s signature rust-colored coat. It’s possible of course to breed a Vizsla Black Lab mix, Vizsla Chocolate Lab mix or Vizsla Yellow Lab mix. Each potential litter will give different colored puppies. 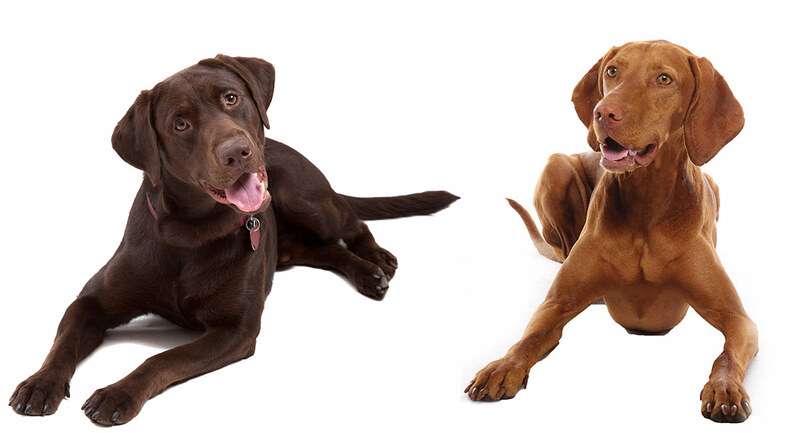 Vizsla-Labrador mixes may inherit the Vizsla’s short coat, or they may inherit the Labrador’s double coat. This has a soft undercoat below a courser top coat. The good news is that regardless of which type of coat he has, a Labrala will just need a weekly brushing, although more during shedding season if he has a double coat. Labradors are a very high shedding breed, so in the moulting season (which for them can feel like most of the year) you will find you need a very good vacuum. You won’t know what your pup’s shedding situation will be until you bring him home, so assume it will be high. Hybrids like the Vizsla Lab may be prone to develop health conditions that are carried by their parent breeds. Some illnesses that are common, regardless of a dog’s breed or mix of breeds, are hip dysplasia, eye diseases, allergies, and skin irritations. Unfortunately, some dogs are more likely to develop one or more of these conditions due to their genetics. Both Labradors and Vizlas are pre-disposed to hip dysplasia and allergic skin conditions. In addition to these, Vizslas may also be affected by sebaceous adenitis or polymyositis. According to a 2012 study, sebaceous adenitis is a common ailment in Vizslas. This inflammatory skin condition results in hair loss that may be accompanied by drying, scabbing, and scaling of the revealed skin. It’s mostly an issue in short-haired dogs. Polymyositis results in the inflammation of muscles that leads to weakness and eventually muscle atrophy. According to the Journal of Veterinary medicine, Vizlas in the United Kingdom are presenting with this condition, specifically in the throat area, in increasing numbers. 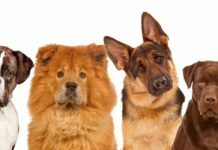 Health testing matters, even if you are buying a breed mix. 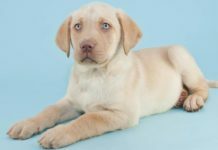 If you’re planning to purchase a Labrador and Vizsla mix puppy from a breeder, be sure to find a breeder that employs genetic testing on their breeding stock. This will help to ensure that they aren’t creating a line of dogs with lots of bad genes, so to speak. As a minimum both Lab and Vizsla parents should have good hip scores and clear eye tests of less than a year old. The Lab parent should also be DNA tested clear for PRA and have good elbow scores. For dogs with a tendency to develop hip dysplasia, keeping their weight in check throughout their lifetime will be essential. Therefore, a Vizsla Lab mix will need lots of exercise not only for his mental stimulation, but also for his physical health. You’ll need to be prepared to take your dog on at least one long walk per day, and do a lot of fun training exercises. Playing fetch is a must for this active dog from two retrieving breeds. Your dog will also benefit from lots of off-leash self-exercise, so a fenced-in yard and access to a dog park will also be useful. If you’re a highly active individual yourself, then take advantage of a Vizslador’s athletic talents and take them on runs, hikes, or even swims with you! They’ll love the one-on-one time, and their joints and weight will benefit from the physical exertion. Hybrid dogs can be expected to live about as long as their parent breeds. Although there is some evidence that they can live a longer little than pure breeds. A Labrador Vizsla mix should live to about 12 years old. Breeders of Vizsla Lab mix puppies are few and far between, so you will have a wait for a good one. Don’t be tempted to rush into accepting the first litter you come across. Remember, health testing is vital. Your breeder needs to demonstrate that they are creating puppies not just for money. The mother should have a strong bond with their owner, know her name and have a purpose. Whether this is a treasured family pet or beloved working companion. Most Vizsla Lab mixes are bred for the field, so if you want one as a pet have a good honest chat with the breeder about their energy levels and pet suitability. You may find a Vizslador by perusing animal shelters or breed-specific rescues. Keep in mind that the majority of animals at a breed-specific rescue are either retired breeding stock or show stock. You’ll probably be hard-pressed to find a puppy at a rescue. Working bred dogs in shelters can have trouble with recall or escapism. So make sure you chat to the center about the dog’s training requirements and that you are confident you are able to manage them. If you can, giving a rescue dog a new home is a wonderful and rewarding thing to do. Is a Vizslador dog a good family pet? Before purchasing any puppy or dog, it’s best to carefully consider the breed that you’re interested in before deciding to add a new fur baby to your family. For starters, the Vizsla-Labrador mix matures to a pretty good-sized dog. You will need a medium to large home and an enclosed garden. As high-energy dogs, Vizsladors need plenty of daily exercise and play time in order to keep their weight down and for their mental health. Remember that large dogs like Lab mixes are want to develop hip and/or elbow dysplasia, so buying your pup from health tested parents is vital. If you’ve ever met a Lab or Lab mix dog, then you know their characteristic smile and love of people. These dogs are very loyal and seek companionship, so aren’t suited to full time workers. That’s not to say that you shouldn’t crate your dog for short periods. We recommend crate-training a Vizsla Lab mix, as the Labrador in them may bring out some strong chewing tendencies. You’ll need to find a different dog if you’re looking for a watch dog, as most dogs with Labrador blood do not know a stranger. A Vizslador may lick an intruder to death, but that’s about as bad as things will get. If you have an active household, love spending time training and have room at home to spare then a Vizsla Lab mix could be a great addition to your family. Haley et al. “Breed-Specific Polymyositis in Hungarian Vizsla Dogs,” Journal of Veterinary Internal Medicine, 2011. Simpson and McKay “Applied Dermatology: Sebaceous Adenitis in Dogs,” Compendium, 2012. The Vizsla Club of America, “Timeline of Vizsla and VCA Firsts,”. Labs are mainly retrieving dogs but they can be trained to point.My Lab is a pointing Lab and is used on upland game and waterfowl both. A 16 week old Vizsla Lab was just surrendered to a rescue group here where I live in Colorado. This rescue group takes their rescues and trains them to be service dogs for people in need. Although they have a very long detailed application to apply for one of their service dogs, I had to apply for a wheel chair assistance service dog since I will be moving into my own apartment from living in a nursing home for nearly 8 years. Luckily I was able to have my 8 year old cat (who is 16 now) live with me. I am such a huge animal advocate and lover, that its unreal! Any way, my question is How do you feel about this Vizla Lab as a wheelchair service dog. He will be with me at all times, an the town I am going to be living in is close to 3 different dog friendly parks. I also would like to know if thus breed if dog makes a good cuddle pet. I care for and live my animals just as if they were a human child of mine. They get the best of everything that I can provide. Most of all, my time and unconditional love and devotion.